This story first appeared on May 5, 2015. In the basement, a few days after the bombs dropped, Ruth Beckett’s parents try to make her eat. She’s pregnant and eating for two. It’s not just about her anymore, her mother reminds her. “You don’t know that,” her mother replies. “He is! He is! I know he is,” Ruth sobs. “We’re breathing in this radiation. All the time. My baby, it’ll be ugly and deformed.” Ruth rejects the food and turns away from her mother to cry in the corner of her family’s hovel. Jimmy Kemp — her fiance and the father of her unborn child — is dead. He was outside when the nuke exploded over Sheffield. Ruth’s baby — a daughter — will not be deformed. But that’s not a cause for celebration or joy. She’ll give birth to her child on a pile of rubble in the ruins of Western civilization. Her daughter will grow, work and give birth to her own child. But it would have been better if Ruth had never had her, because this is a world without hope or comfort. This is the world after nuclear Armageddon. In 1982, Mick Jackson produced and directed a short documentary for the BCC’s QED science program called A Guide to Nuclear Armageddon. The short film approached the subject from the point of a view of regular people. What would happen if a bomb exploded over London? What could normal people do? How could they survive? The program was a hit, and the BBC wanted more from Jackson, so he traveled around Britain and America for the next year researching the effects of nuclear war. He consulted with scientists such as Carl Sagan and took copious notes. When he got home, he called up writer Barry Hines and the two created a dreadful misery of a two-hour made-for-TV-docudrama called Threads. As someone who takes in a lot of horror fiction — and has a strong metabolism for it — watching this movie was a visceral and genuinely disturbing experience. Threads has a lot in common with The Day After, the American made-for-T.V. film that saddened Pres. Ronald Reagan. Both are low-budget films, both depict the lives of regular folks after the devastation of nuclear war and both frightened audiences into a stupor. But Threads is better — it’s relentless and unflinching in its constant parade of horror. Jackson and Hines take pains to not only show the devastating physical effects of radiation, but how society breaks down in the wake of such massive destruction. “The connections that make a society strong also make it vulnerable,” the film’s narrator explains in the opening moments. It centers on Sheffield, an industrial city in the United Kingdom, and it follows the lives of two families — the Becketts and the Kemps — whose children will soon marry. In the background — on TVs, radio and newspapers — the world speeds toward nuclear war. The Soviet Union invades Iran after a failed coup. The Kremlin blames Washington and says America wants to destabilize the region. So America’s military invades Iran from the other side and the two armies speed towards each other. Washington gives the Kremlin an ultimatum, which the Soviets ignore. Both armies use tactical nukes in the initial fighting. The two families’ lives go up in gout of nuclear flame when an atomic bomb explodes over Sheffield. There’s a full-scale nuclear exchange. From there, it’s hard to describe how frightening this movie becomes. Threads came out in the 1984, but it’s still effective. It shouldn’t still work. It’s campy and full of stock footage and documentary-style asides where a dry British narrator explains the effects of nuclear war. “An explosion … has sucked up this debris and made it radioactive,” the maddeningly calm narrator explains while stock footage of destroyed buildings plays on the screen. But then, the camera lingers outside in the rubble. A teddy bear burns, a man wallows through the rubble and a cat twists behind a wall of flame. A single, blackened hand, the flesh curled from the fingertips reaches toward nothing before fire engulfs it. As bad and horrifying as the initial attack is, it’s calm compared to what follows. 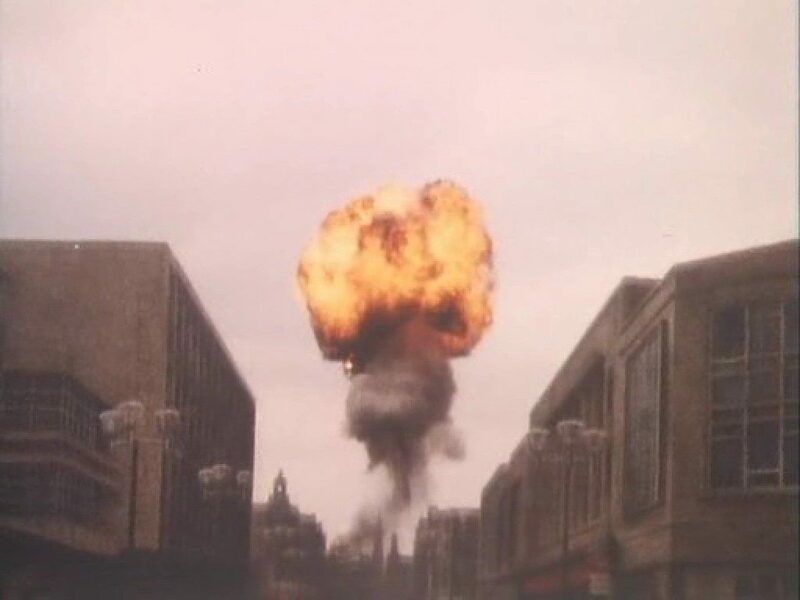 “The entire peacetime resources of the British Health Service, even if they survived, would be unable to cope with even the effects of the single bomb that’s hit Sheffield,” the narrator explains over footage of irradiated, moaning civilians. Dirty, bloodied bandages cover limbs and faces. A sob breaks through the crowd. Women wail. Men beg. There is no hope here. “By this time, without drugs, water or bandages. Without electricity or medical support facilities there is virtually no way a doctor can exercise his skill,” the narrator explains while the camera pans over the faces of the wretched and dying. If this is tough to read — and it was tough to write — watching the events depicted on screen is far worse. But there was a point to the film’s grotesque events. The filmmakers wanted to show the absolute worst-case scenario. This isn’t a dry and utilitarian analysis of nuclear war. It’s not a survivalist fantasy. It shows the effects of the bomb on families and children — the weapon’s primary victims in the event of such a war. “It seemed to me that people weren’t able to visualize the unthinkable, especially politicians,” director Jackson told The Scotsman in 2009. Ruth lives through the war, and survives for years after it ends. But the world is different … it’s medieval. Works toil in the fields and men shoot boys on the street for stealing small chunks of bread. Britain now resembles a largely depopulated version of itself from the 14th century — with less sunlight due to ash covering the sky. But the main thing is that the film worked. Would you want to live in a world like this? Threads absolutely forces you to face the unthinkable.